For most families, school bus service is a given: The bus shows up; the kids go to school. But in some places, rising costs are causing districts to charge parents school transportation fees — and collect on their debts. In one year alone, San Diego Unified School District referred hundreds of parents to a collection agency for not paying for their kids’ school bus rides. According to data from the 2014–15 school year, the district took action against 380 parents for unpaid school transportation fees, ranging from just $10 to as much as $500. Though the district’s actions may not sit well with many, they are not without reason: In 2014–15, families owed the district more than $160,000 in outstanding fees, only 15 percent of which were recouped by the collection agency. Although this case provides a uniquely unfortunate example, school transportation is a complicated issue, which we briefly explain in our new video, “Better Buses: Three Ways to Improve School Transportation, in Under 3 Minutes.” When families rely on bus service, it becomes a key component of districts’ instructional mission — students can’t learn if they can’t get to school. 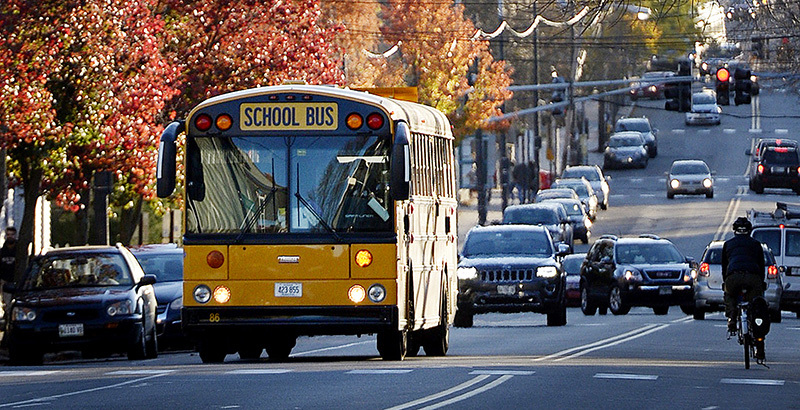 Providing bus service can be very costly for school districts. Since 1980, the average cost per student transported has increased more than 75 percent, due largely to steadily declining ridership and increasingly complex education systems. In the 2012–13 school year alone, districts spent roughly $23 billion on transportation, around 4 percent of all public education expenditures. Transportation costs also tend to be volatile and unpredictable because they shift dramatically with the cost of fuel; and because state funding for transportation has been stagnant, districts have been left to handle rising costs and volatility on their own. Although charging parents school transportation fees in response to rising costs is a relatively uncommon practice nationwide, San Diego is not alone. A dozen states allow districts to charge such fees, and Hawaii charges fees at the state level, though 19 other states prohibit them. Certain districts in California, Colorado, Iowa, Kansas, Massachusetts, and Texas have begun charging parents for bus service. In a survey of districts in multiple states, fees ranged from $180 to $575 per student per year. While San Diego opted to charge fees, other California districts facing cost pressures, like the San Francisco and Los Angeles unified school districts, have shrunk transportation costs by largely eliminating the service altogether. Both districts provide transportation to only about 5 percent of their general education populations, instead relying on local public transit systems. Investing in data and technology. Districts need more information about their transportation systems in order to improve service. Therefore, states should invest in technologies that enable districts to collect, analyze, and use information that informs operations and customer service to families. Providing financial incentives for efficient design and investments. Though districts face tightening transportation budgets, most actually have few incentives to make short-term investments that yield long-term efficiency gains. States should incentivize these types of investments in their funding models. Thinking more broadly about how school transportation intersects with other transit systems. In many districts, particularly those located in sizable metropolitan areas, a large transportation infrastructure likely already exists. This should be tapped by districts to spur new avenues for cooperation and collaboration with local and regional transit systems. The fact that so many districts struggle to provide adequate bus service is a clear indication that we must start thinking bigger about school transportation. Phillip Burgoyne-Allen is an analyst with Bellwether Education Partners. Previously, he worked for Brustein & Manasevit, a law firm specializing in the management and regulation of federal education grants, as well as the moderate think tank Third Way.